Animus arrives on the scene and declares that it has begun the Armageddon with the help of the End of Days scroll. Golani atacks the behemoth, who orders the possessed Al’Falqa and Katmandu to protect him. The TMNT and Ninjara have their hands full fending off human attackers. April and Oyuki arrive and try to get some footage of the battle. April shines a bright light on Animus, which cause the creature to recoil. Golani realizes that the monster fears the light, and so she blasts him with hers. Animus fades away, but vows that he will return that night. Master Splinter reaches Michaelangelo’s side, and discovers that his son has been blinded from the explosion that he was caught in. Our heroes go back to their hotel to plan and recuperate. The group decides to take the fight to Animus and head off to find his hideout inside the Fortress of Nimrod. Oyuki stays behind with Mike, who can’t leave due to his blindness. Later that evening, the TMNT, Splinter, Ninjara, Al’Falqa and Katmandu find the Fortress entrance and go inside to investigate. They’re immediately attacked by the men who freed Animus, but our heroes make short work of their foes. The Turtles find what they think is a giant statue of Animus, with the End of Days scroll at its base. Golani picks up the parchment and flies off with it – which causes the statue’s eyes to glow. It wasn’t a statue afterall, but Animus himself! Without the power of the scroll or its followers, the monster begins to shrink down in size, until its merely a few inches tall. Ninjara borrows a snow globe that Oyuki had bought as a souvenir and traps the miniature Animus inside. 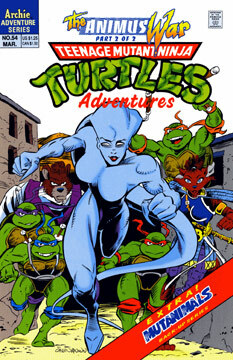 Additional Content: 8 page Mutanimals story by Clarrain, Brown, Talbot and Lawson.